Jonathan is a former President of LDAWE. He has been diagnosed with severe dyslexia and mild ADHD. He is often asked to speak at local events and with the media about the coping strategies and accommodations he uses to be successful. Read more about Jonathan’s journey in the article below. A bright kid with ADHD, Sinasac couldn’t focus, was unable to filter out background noise, was hyperactive and was teased because the other students could sense he was different. He was doing so badly the school was talking about holding him back. It took a bribe — his grandfather offered him $1 a day if he finished the year — to get him to return. By Grade 8 he was failing science and teachers were telling him he should go to a vocational high school and become a mechanic or something. 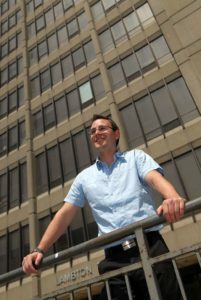 Today, at age 30, he holds an engineering degree and an MBA and works as a communications engineer at the University of Windsor. He’s coped and flourished with attention deficit hyperactivity disorder largely thanks to the coping mechanisms and structured life he learned to live when he was sent to a residential school for kids with learning disabilities. “It was almost like military school,” Sinasac says of his year-and-a-half stay at the Amethyst school for kids with severe learning disabilities in London. It instilled the kind of structure touted in a Psychology Today article that examines Why French Kids Don’t Have ADHD. The much-debated article by Marilyn Wedge examines why “at least nine per cent” of school-aged kids are diagnosed with ADHD in the U.S.– she calls it an epidemic — while in France the rate is less than 0.5 per cent. She says French children are raised with enforced limits, better eating habits and a family hierarchy in which parents are in charge. “As a therapist who works with children, it makes perfect sense to me that French children don’t need medications to control their behaviour because they learn self-control early in their lives,” Wedge writes. Perhaps that structure isn’t a part of our culture in North America, but it can be emulated, experts say. That’s effectively what Sinasac did when he learned that to cope with his ADHD. He needed to be disciplined about going to bed early, modifying his diet, exercising a lot and employing study practices — finding a quiet room, closing all the windows on his computer desktop, shuting off the music — that minimized the distractions. When he returned to regular high school in the middle of Grade 9, he was achieving grades in the high 80s and low 90s, and those coping mechanisms he learned at Amethyst helped him excel in university. Wedge argues against the U.S. approach that defines ADHD as a chemical imbalance in the brain that can be treated with drugs like Ritalin and Adderall. In France, she says, doctors look for external factors that are causing the child anxiety and stress and try to address those causes with therapy or counselling. Dr. Cory Saunders, a developmental neuropsychologist who is director of access and co-ordination for family mental health and addiction at Windsor Regional Hospital, believes the ideal way of treating ADHD is somewhere between the U.S. and French approaches. The fact is that the brains of kids with ADHD function differently and medication can help with the symptoms that cause them to be hyperactive and unfocused, he said. But he also tells parents a structured life, good sleep patterns and diet really help a kid with ADHD. Wedge “makes some good points in the sense that we can’t rely on medication as a silver bullet to fix it all,” he said. Saunders said he advises parents to not jump to medication as the first course of action, and to instead look for other approaches that don’t have the potential side-effects that drugs do. He said comparing the low rate of ADHD in France with the higher rate in the U.S. is like comparing apples and oranges because the French have a different way of diagnosing the disorder. University of Windsor associate psychology professor Carlin Miller disputes Wedge’s 0.5 per cent estimate for France. The research she’s seen shows the rate in Europe is similar to North America — between three and seven per cent of kids. It makes sense for France to have similar numbers because our gene pool is similar and ADHD is a genetic disorder, she said. If you have a parent who has it, your likelihood of having it is 25 per cent, rising to 40 to 45 per cent if both parents have it. Typically, at about age six children start to show symptons like inattention, difficulty staying on track and being distracted easily by external sources such as the sound of a lawn mower or pencil sharpener or internal sources like wondering what they’ll have for breakfast. The hyperactivity looks like the Energizer bunny that keeps going and going and going, Miller said. “It is the irresistable urge to touch something, pick it up, take it apart,” said Miller. Miller, who researches ADHD, believes the incidence is rising moderately primarily because of increased awareness. By puberty, about 40 per cent of kids get noticeably better. And for many of the people who continue into adulthood with ADHD, they find environments where they learn to be successful. One of the most prominent is TV’s Ty Pennington, who went on medication after being diagnosed in college. Medication, said Miller, is largely effective: 70 per cent of kids who take it see improvements. “It really improves attention, it reduces hyperactivity, it reduces impulsivity,” she said. But “it’s not terrific for secondary symptoms,” like academic problems and social problems. Miller agrees with part of Wedge’s premise that the French way of raising children is better for kids at risk for ADHD. “We’re not doing a terrific job as a culture because we’re very, very child centred” in North America, Miller said. And children as a result become like “little emperors and empresses in their homes and take over family life.